I finally got the chance to see this movie after it premiered in Indonesia for more than 3 days. I was travelling to my mother's hometown for the past 4 days and my wife was feeling tired so she did not accompany me this time. I went to see this at Epicentrum XXI to enjoy the Dolby Atmos sound system but the time was very tight as it played at 6.25PM. Lucky for me I could use different route and despite having further distance, I was able to reach the location much earlier than if I use the usual way. Anyway, let us get on with the film. 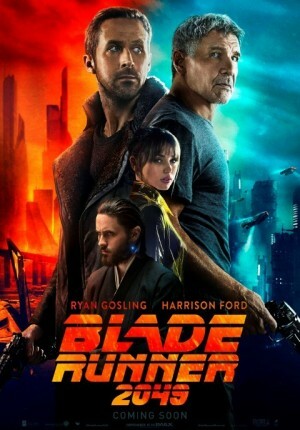 The movie was told in the year 2049, 30 years from the time of this film's predecessor Blade Runner. We were introduced to our main character, a Blade Runner simply referred to as "K" (Ryan Gosling - The Notebook, The Big Short etc) who was also a bio engineered human called Replicant. It was an uncommon thing as the older Replicants used to be hunted down by Blade Runner. K reported to his superior Lt Joshi aka Madam (Robin Wright - Forrest Gump, House of Cards TV series, Wonder Woman etc). K did not have any friends and only accompanied by a hologram with AI referred to as Joi (Ana de Armas - Overdrive) whom he seemed to fell in love with. During one of his assignment involving an older replicant named Sapper (Dave Bautista - Spectre, Guardians of the Galaxy Vol. 1 and 2 etc), K found something from the past which required further investigation. This investigation led him to find out information from the archives of old files kept by Wallace organization who took over from Tyrell Corporation, where he met the person in charge called Luv (Sylvia Hoeks - Renegades). Luv was working for Niander Wallace (Jared Leto - Dallas Buyers Club, Alexander etc) who also wanted to find out more on the investigation held by K.
The more K looked into this matter, the more things seemed to unravel which might have a lot to do with his own past. He also found that it might be related to a former Blade Runner named Rick Deckard (Harrison Ford - Indiana Jones quadrology, Star Wars series and many more). So could K get to the bottom of this? Could he finish the assignment from his superior? Why did Wallace organization took interest on this as well? Find them all in this mystery science fiction movie. I got to say, after watching the prequel movie again just last week, it was still rather fresh in my mind on the original story and hence I was not having too much difficulty understanding the sequel's story. In fact I was able to enjoy and appreciate this movie's references to the 1982 movie, such as the cameo appearance of few characters from that one, or the recordings of some scenes etc. The story of this movie really linked to the prequel a lot and I think it would be challenging to understand this one if you did not have the background understanding of the first movie. Apart from the story itself, the movie was having lots of really beautiful visual effects and I totally agree with the words critics said that it was "visually stunning". The details of scenery were done wonderfully like the scenes in what I think was Las Vegas deserts and the city scenery (which was obviously a lot lot better than the effects of the prequel). The special effects? Totally awesome and amazing! The creation of Joi's hologram was very very good and those flying cars effects were also great. Fans of special effects in a movie would be pampered with the generous eye popping various marvelous effects here. Oh, the sound effects of this movie was also really great. Dolby Atmos sound system certainly did not disappoint this time. Please be reminded that this is a sci-fi movie involving a large mystery to solve. The focus of the movie was the investigation itself which led to few twists and a jaw dropping totally surprising moment which you would understand if you watch this one without distraction. Being a 2 hour 40+ minutes movie certainly had its perks of explaining everything in details. However I personally feel that it could have been shortened a bit as I think there were some scenes that could have been made brief. I could understand also that the pace of the movie felt slow for general audience. I myself was lucky enough that I had watched the 1982 movie first and already knew what I was getting into, so when I watched this film, I was already expecting the same kind of pace. The only challenge was to keep focusing for the entire duration of the movie as you might missed out on some important clue. To my personal opinion, contrary to popular views of the general audience, I actually enjoyed the movie. It was having lots of stunning visual effects, great special effects, amazing sound effects and an old fashioned mystery to solve. I also think that the heart of the story was easier to absorb compared to the prequel which I felt was having too much philosophical parts. My only regret was the movie's long duration and the slow pace made it difficult for general audience to enjoy and thus it would be struggling to have commercial success. The director Denis Villeneuve who also directed good movies like Sicario and Arrival was able to continue Ridley Scott's visions and there are rumors that the movie might be good enough to be nominated for various awards. Will see that in few months time. In conclusion, I think the movie is indeed a critical darling and I happen to agree with critics opinion on this movie, but I believe it might not appeal to general audience especially due to the pace and the duration. However, if you could just go in with open mind and focus on the story and its effects, I think you could enjoy it as I did. 4. Avoid drinking too much liquid so you could stay in the theater for 2hr 44 minutes. If you had to go, better do it after 1 hour or so. There was no end credit scene for you to wait, so you can leave immediately once it is finished.